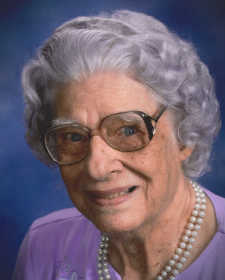 Marjorie Maxine (Noel) Range, 99, of Nevada, passed away peacefully on Feb. 16. She was born Aug. 25, 1918, four miles south of Bronaugh to Karl F. and Lydia E. Naffziger Noel. When Marjorie was six months old her parents purchased a farm one mile north of Bronaugh where she grew up with two younger sisters and one brother. Marjorie graduated from Bronaugh High School in 1936 and worked at household jobs until 1940 when she entered Draughon’s Business College in Springfield. In 1942 she began working at the M. J. Morse Offices at Thayer, Mo. Marjorie and George Arthur Range were married Jan. 8, 1944, in Thayer. She joined her husband in Norfolk, Va., where he was stationed with the U.S. Navy. There she worked in the billing department of a large department store. While George was at sea, Marjorie was employed in Wichita in a defense plant, then at Camp Clark in Vernon County. Following World War II, George and Marjorie settled on a farm at Willow Springs, Mo. George died in 1949. Marjorie returned home with a two-year-old son and expecting a baby. Moving into Nevada when her two sons were small, she worked at Montgomery Ward and Logan Moore Lumber Co. She served as receptionist and office manager for Ozark Production Credit for 24 years until retirement in 1983. Marjorie was an active member of St. Paul Lutheran Church. She enjoyed membership in the Quilt Guild and the Garden Club and served as a volunteer in the NRMC Gift Shop and the Red Cross Blood Bank. Marjorie was preceded in death by her husband, George Arthur Range; her son, Karl Edward Range; parents Karl F. and Lydia E. Noel; sister, Geraldine (Noel) Roggensees and sister, Millicent (Noel) Meyer. She is survived by her son, George W. Range (Helen), Nevada; her brother, Norman L. Noel and his wife Rosemary, Bronaugh; and many beloved nieces and nephews. The family extends their gratitude to Morningside and Moore-Few Care Center; doctors, nurses and staff for their loving care. We are also thankful to Pastor Deines and friends that continued to stop by and visit with her. Memorials are suggested to St. Paul Lutheran Church in care of Ferry Funeral Home in Nevada. A celebration of life service will be held at 11 a.m. on Saturday, Feb. 24, at St. Paul Lutheran Church in Nevada with the Rev. Chris Deines officiating. The family will receive friends from 10-11 a.m. prior to the service. There will be a light lunch to follow at the church. Interment will be held at 11 a.m. in Willow Springs Cemetery, Willow Springs, Mo., on Monday, Feb. 26.